Would you pay R165 Million for this? You are here: Home / Editorial / Letters to the Editor / Would you pay R165 Million for this? The impoverished people of Hankey in the Eastern Cape were promised jobs by the failing ANC government in the construction of the Sarah Baartman Remembrance Centre. Four years down the line the R165 million centre is incomplete and nothing came of the ANC’s empty promises. Four years down the line, this is what the R165 million Sarah Baartman centre looks like today. Poor planning and even worse workmanship have contributed to the people of Hankey not benefiting from this R165 million government project. The heritage centre is being built by the national Department of Public Works on behalf of the national Department of Arts and Culture. The centre aims to boost the local economy, create jobs and honour the late Sarah Baartman. Today, 9 January 2019, I conducted an oversight inspection at the site of the incomplete centre. I was joined by Phumzile van Damme, DA Team One South Africa Spokesperson for Corruption, Andrew Whitfield, EC Premier Campaign Spokesperson for Access to Jobs, and Bobby Stevenson, EC Premier Campaign Spokesperson for Crime and Corruption. We also paid our respects at the grave of Sarah Baartman. We were greeted by 72 locals who fell victim to the failing ANC’s corruption and mismanagement. Many of them have been fired or are on strike, because they are not being paid the money promised to them. The poverty they experience has now led to them not being able to send their children to school. 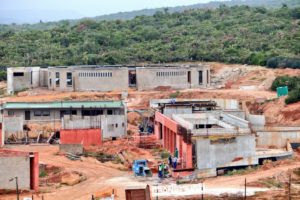 The completion of the Sarah Baartman Remembrance Centre, of which construction started in April 2014, has now been delayed by more than two years. The completion date of October 2016 was missed and the new promised completion date of March 2019, is clearly a pipe dream. A change of contractors and worker unrest due to non-payment, all threw a spoke in the wheels of this project. The failing ANC government promised that a 1000 jobs would be created during construction, and 134 locals would be permanently employed after the completion of the project – but very little came of this. When the DA-led coalition governed NMB much was done to increase EPWP opportunities. During our 24 month tenure in government we tripled the number of EPWP jobs created annually and created a fairer EPWP work allocation system. This translated into the creation of almost 5 500 EPWP jobs. The Western Cape created more than 75% of all the new jobs in South Africa in the first quarter of 2018. The DA has a plan to create an environment in which businesses want to invest and in which sustainable jobs are created. And once these jobs are created, only a DA government will guarantee fair access to real and long-term jobs, fight corruption and bring the change that will build One South Africa for All.